Be Still Beloved . . .
Be still and know that I am your God. 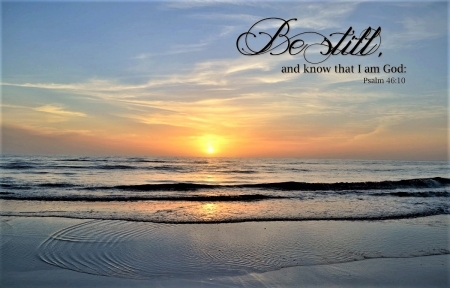 Be still and know Me not just know about Me but to commune with Me and love Me. If you love Me, you will spend time with Me and learn of Me through My written word. Through the scriptures, you learn of My ways, My works and My love for My people. Many do not spend enough time with Me just basking in My intimate presence and love. This is the day of the great falling away and it all begins with the spirit of independence and pride, that feeling that you do not need God; I can do my own thing without Him. You spend time with the one you love. The basis for having a pure and holy relationship with the one you love is undistracted communion, undivided attention, and love. Spend time quietly with Me even if you have to go into a prayer room, a place you can go that is set aside and sanctified for Me. Learn to hear My still small voice by being still. Hunger for My presence and to hear from Me. Yes, this is the basis of all life to be able to commune with Me. It is of great importance that you hear My voice. I will lead you in My word. I will share the burdens of intercession with you. Lean not on your own understanding but in all your ways acknowledge Me and I will direct your paths. Be desperate to know Me so you can pray in unison with Me alone not what you think you should pray about. I am your God and you are My people. Draw close to Me and separate yourself from the busyness of the world and all it has to distract you that includes the electronic devices that many are addicted to. They devote more time and commitment to those things than Me from first thing in the morning to the last thing at night. That is a god! That is idolatry. If My people who are called by My name would seek My face and pray and turn from their wicked ways, then I will hear their prayer, forgive their sin, and heal their land. Because so many have given into idolatry they are tossed about by every wind of doctrine, deception, and demon, from witchcraft, spiritual adultery, fornication, every lust and perversion of spirit thinking that what they are dabbling in is of Me but it is all of the enemy. Repent, get set free and close the doors and start anew. Make Me the first of your day to commune with and the last thing at night and see what I will do for you and your country says your God. Cast off your idols. Choose this day who you shall serve. I am the Lord your God do not have any strange gods before you.